This posting is still being written and edited, but I've posted it early so that Yessi and Fran, and any others interested parties, can see the magnificent views surrounding Glacier Peak that I've been witnessing the last 2 weeks as I've hiked several hundred miles. BMW and an Osprey Pack, everything I need, except Yessi! 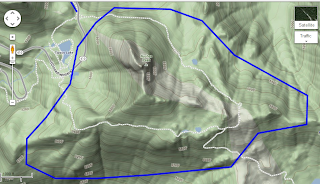 I have been charged with hiking all the trails on GT map #111 and #112, which include Glacier National Park as well as the trails immediately surrounding Glacier Peak, and many of the smaller trails to the west. Let this picture speak for itself, but it's just awesome up here. I gave up many of the shorter trails that were assigned. They can easily be done as day hikers which seems to be the preference of most of the other mappers. I've chosen to focus on the long trails and areas hard to reach, utilizing my thru hiking skills well developed during my 5000 miles of hiking last year. Glacier Peak and it's surrounding area designated as National Park, is an outstanding portion of the Cascades. In my opinion, it easily rivals the Alpine Lakes Wilderness and holds it's own against the trails around Mt. Rainier. Suiattle river only a mile or two from the Chocolate glacier, it's head waters. Even crossing this little stream was tough. The trail was pretty much non existent and will be marked not as a trail but as an old route on the new Green Trails maps. This particular spot is about 35 miles from where you park. Though Glacier Peak is a mere 10,541 feet tall as compared to Mt. Rainier at 14,411, what it lacks in shear magnitude, it makes up for in it's remoteness. Not only is Glacier Peak far from any parking lot, requiring much longer hikes to approach the mountain, but it's as if it's hidden by the peaks and ridges surrounding it. Yessi has a thing for old VW vans. We had many dreams of working for TuTwo traveling China and promoting wilderness activities and skills out of our little mobile adventure center just like this. It is elusive to say the least and even when hiking the PCT, there are only a few short glimpse of the mountain and one stretch about 2 miles long following Red Pass where the mountain can be viewed. It is hard to get to, hidden by surrounding topography, and just a stunning mountain with rock bands and ridges escaping the grasp of glaciers hanging on to their hold on the mountain. The rivers around it are a raging stormy gray, full of silt as the water washes away anything in it's path. One walks along long river valleys to approach the mountain. In and around Glacier Peak Wilderness, somewhere above the White Chuck river. Freestyle along the PCT, three years in a row. dbBrad is Freestyle is HeartOnTheTrail.com is on the PCT again, 3 years in a row. 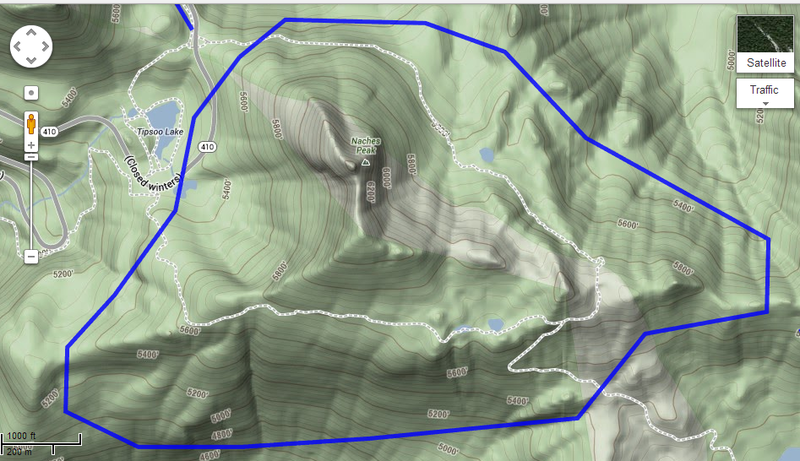 Two new trails will be added to the GreenTrails map #112, a nice little loop of both the climbing routes for Glacier starting at the Foam Creek trail, midpoint at the White Chuck Glacier and down the valley and back up to Red Pass. It's part trail, part route, but not to be missed. Stunning views of that hard to see Glacier Peak. My head in the clouds again! Almost two years ago, I was on the PCT hiking Sobo (SouthBound) at Chinook Pass. I was looking at the meticulously reconstructed pedestrian log bridge over the highway when a woman came running down the trail needing assistance. If Yessi and I have kids, I can only hope they will be as wonderful as the Lipinski Twins. 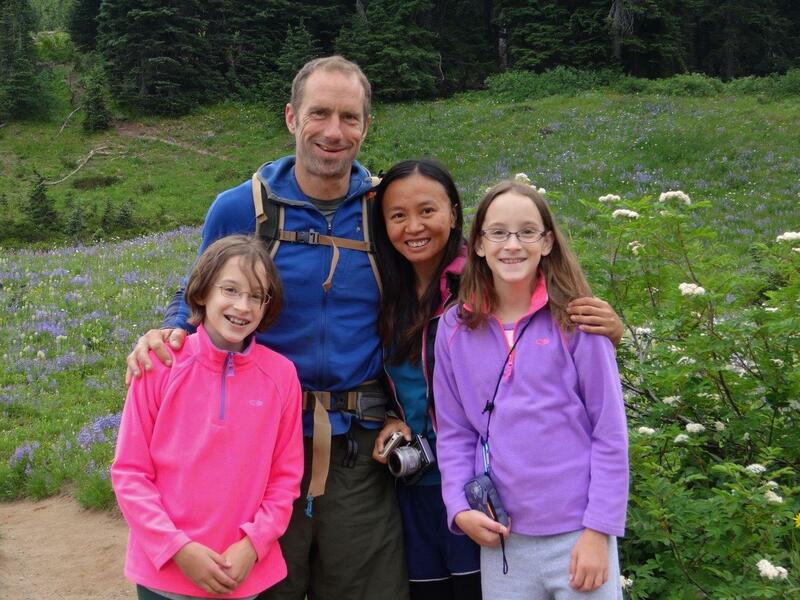 This woman later turned out to be Debbie, mother of two fabulous twins and two boys and friends with Davit S. But at the time she was a hiker looking for help for an elderly man who stumbled off the trail at a very steep section and was trapped below and injured. Yessi and Brad with the magnificent Mt. Rainier in the background. It was not a clear day and lot's of haize, but somehow David was able to take this great photo. I followed her and assisted her in helping the man up to the trail until emergency help arrived. We had a chance to talk and became instant friends. A boo boo on her little toe. Just goes to show that even a short hike warrants carrying the 10 essentials which should include a first aid kit with a little toe protector! I had my knife and suggested amputation, but she opted for treatment from David. This was an exciting first encounter and we have remained in touch. Debbie is one of my biggest hiking fans following my adventures on my blog. The twins freestyle with Freestyle! 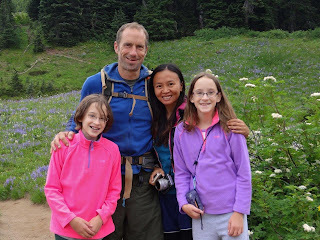 So last year when I was hiking the PCT in it's entirety, I again met Debbie at Chinook pass. This time I was the one looking for help. 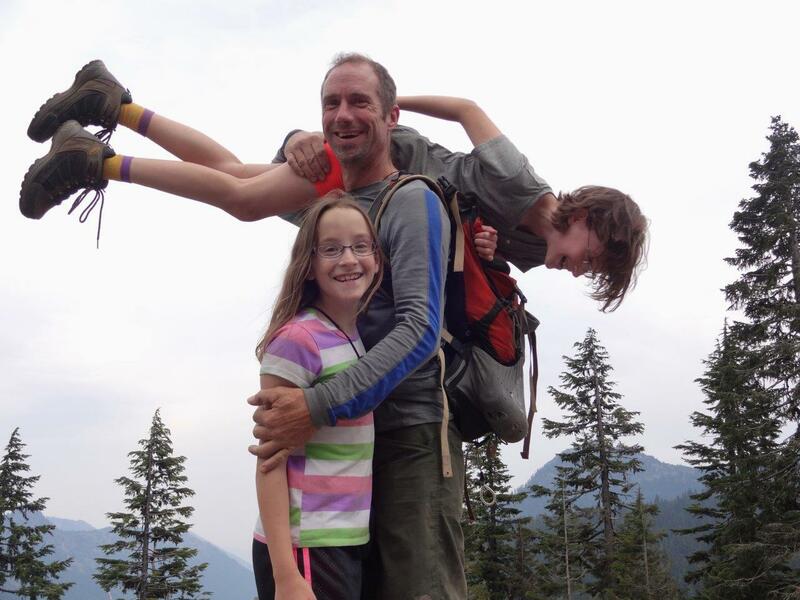 David, Debbie and the Twins along the Naches loop trail. After hiking over 2000 miles from Mexico to get there, I was hungry and tired and she took me home to her fabulous family and offered me a shower, clean comfy bed and lots of food. Yessi Ye on the PCT again, southbound this time. We made an agreement to climb Naches Loop the following year. The climb ended up not being as important as the outing, and instead, we opted for a larger hiking party including Yessi and I, Debbie and her two twins, and David. We hiked the 5 miles around the peak rather than climbing the peak but had a truly wonderful day. Yessi and David with Rainier in the background. After the loop, we took a drive up to Sunrise, where David bought the entire crew Ice Cream and where we wondered around the old log lodges, read about glaciers, volcanoes and plants and animals in the ranger station. Naches Loop Trail, compliments of Google maps 50 hikes around Mt. Rainier. The reality is, one can't have a much better day than a hike with friends and family. Even a short hike can provide opportunity for exercise, some adventure and climbing, plenty of time in the car to talk and build relationships, and views of wonders like Mr. Rainier that can inspire one for months to come. It takes two photographers to capture those twins! Naches Loop may be short and might not have a lot of verticle, but it is one of those short hikes that is so sweet. Right off the highway, it has easy access, but within minutes you leave the road behind and feel as if you're miles from anything. Doing some bouldering with the twins. 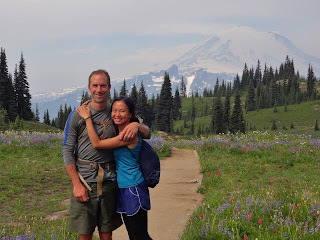 Besides views of Rainier, there is a small lake along the way, steep forested hills, rocks, snow fields melting into streams, wildflowers, outstanding views of Mr. Rainier, and some meadows with ponds full of poly wogs. A bit of everything in one wonderful little hike. David and Brad. I feel very fortunate to have been introduced to David, who has been incredibly generous and supportive to me. One picture with the 5 of us, only possible with an iPhone! Debbie, Yessi, Brad with Erica and Meagan up front. Photo by David. 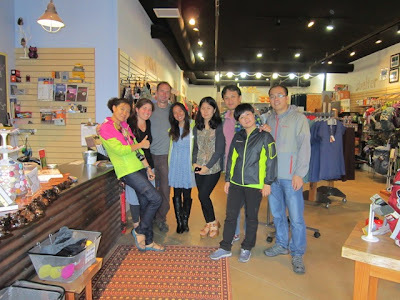 Wednesday and Thursday nights were busy for Yessi and I as we made plans for a visit from TuTwo 图途（厦门）户外用品有限公司, one of China's largest outdoor gear retailers. We had stayed up late working on a presentation getting up at 6:30 am with only 4 hours sleep to head to Seattle to pick up a 12 passenger van before meeting the TuTwo visitors. 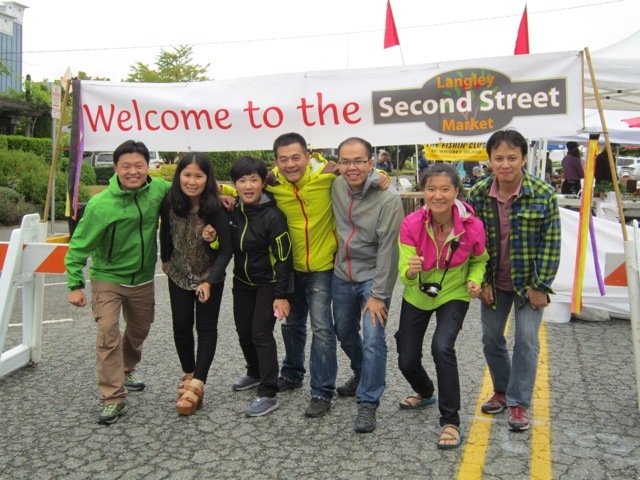 The TuTwo team (图途团队) in Langley at the starting line for the Langley Second Street market. It was a fast paced weekend right from the start, but the TuTwo folks were energetic, motivated and a lot of fun. Yessi and I really enjoyed our visitors, even if we were totally exhausted by Sunday afternoon. The TuTwo crew (图途成员) in front of their model and inspiration, REI Flagship, Seattle WA. Our first stop was to head back north passing Boeing and then to have a ferry ride to Whidbey Island where we visited Langley, Mukilteo Coffee, Wander on Whidbey. Yessi and I thought a ride on the water was the best way to quickly show off our beautiful mountains. dbBrad (户外体验及拓展训练顾问), Hammer (图途企划总监林章锋） and Steve (图途总经理黄承辉), the two owners of TuTwo. From the Mukilteo/Clinton ferry, one can catch views of Mt. Rainier, Mt Baker, the Cascade mountains including Glacier Peak and the Olympic Mountains. Unfortunately the clouds limited visibility to about 5 miles and no mountains were to be seen. It just goes to show that you can plan, but you can't predict, hence the advantages of traveling 'freestyle'!! Of coarse traveling freestyle is much more difficult with a group of 9, hence the planning we did. One week previous we had made plans to meet official representatives from Cascade Designs, Outdoor Research, REI, GreenTrails Maps, and Feathered friends which would have included a tour of their factory right here in Seattle. 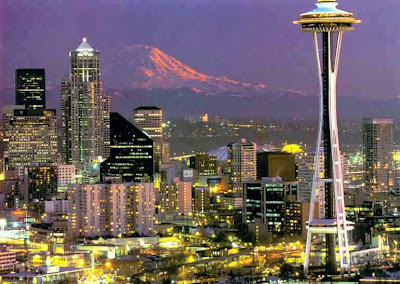 TuTwo had to postpone their trip to Seattle due to issues with their Visas forcing abandoning the original plans. Unfortunately, we were unable to reschedule any of these tours since all my contacts were in Salt Lake City this entire week for the Outdoor Gear Show Expo. 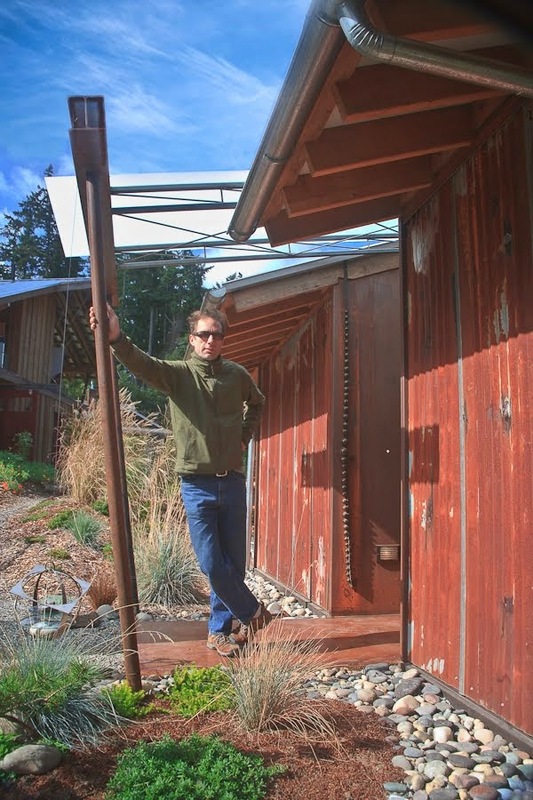 gets all their coffee from this quality roaster on Whidbey Island. We were given a great tour and coffee for the road! In a conversation with REI's Director of Public Relations regarding scheduling a tour of corporate headquarters for TuTwo, I was informed that the three most popular stops in Seattle, in order, are the Pike Place Market, REI Flagship and the Space Needle. It was our intent to deliver all three! only fine-quality gear with a complete selection. forming an alliance in front of REI. We also felt fortunate to get reservations at The Wild Ginger, where we planned to have dinner in the Dragon room to be followed with a presentation by Yessi and I of our amazing solo journeys last year, our meeting, and our fabulous adventures together this summer. crew devoured 5 lbs of crab! To follow dinner we had planned a twilight ride on the Monorail to watch darkness set over beautiful Seattle. Unfortunately, this too had to be canceled. Instead we had the good fortune to meet and spend the evening with the owner of a large importer of outdoor gear in China responsible for $5 million of Osprey packs a year and growing rapidly. TuTwo in front of the Origional Starbucks Store, which opened in 1971. We did get to quickly see many of the great companies of Seattle. Seattle is home to much innovation, evidenced by companies like Boeing, Microsoft, Starbucks, MSR, Cascade Designs, Outdoor Research and Amazon and of coarse, dbBrad (Design Build Brad)! Seattle in Twilight with Mr. Rainier in background. Photo courtesy of Google image search. YESSI and I are very excited to be hosting seven owners and managers from TuTwo this weekend. Tutwo is the name of an outdoor gear retail chain in China. Yessi with the TuTwo flag on the PCT at White Pass near Glacier Mountain. Before Yessi and I left for Nepal, we visited many shops in her home town of Xiamen, and TuTwo had the best selection of real outdoor gear and accessories we were able to find. While we were in China, TuTwo gave us a pair of boots each as well as a TuTwo flag. We've worn out the boots but the flag still travels with us on each hike. Both Yessi and I find that our time in the wilderness is inspirational. Every journey brings new challenges, beauty, adventure, and a renewed sense of accomplishment. While I was hiking the PCT last summer, Yessi was working as assistant to the purchasing director at TuTwo. 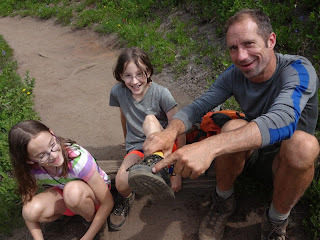 When I finished the trail, she took a leave of absence and came to visit for the summer where we have had one adventure after another hiking lost trails and marking trail features for Green Trails Maps. We have carried this flag hundreds of miles in Nepal, along the PCT near Mexico and Canada both, in the Olympic Mountains, along the California coast near Big Sur, and in the Cascades near Glacier Peak. Getting paid to hike is a great thing and we look forward to having this same opportunity in China. TuTwo has asked us if we'd like to come teach outdoor skills to their employees. This weekend will be all about outdoor activities in the Seattle area. Though we won't be hiking, we'll certainly be putting on the miles as we tramp all over the city, and visit Whidbey Island as well, looking at some of the great outdoor gear retails shops. We have including Patagonia, Ibex, Feathered Friends, Wander on Whidbey, and of coarse, papa bear, REI, on our list of favorites. If you see us flying away on our flag. turned to kite, it probably has something to do with TuTwo!